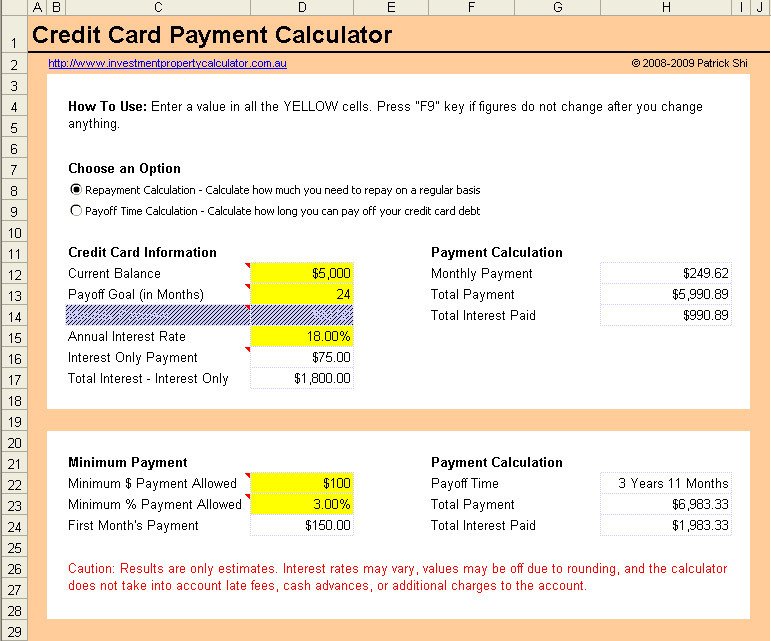 This free credit card payment calculator helps you calculate your monthly credit card repayment. This free credit card payment calculator estimates What it will it take to completely pay off your credit card balance at the current interest rate. You can choose to calculate monthly credit card repayment or how long it will take to pay off your credit card debt. This simple credit card repayment calculator also has a built-in credit card minimum payment calculator which shows your minimum credit card payment if you know either the minimum monthly payment amount or the minimum payment percentage allowed by your credit card issuer. Here is a screen shot that will give you a better idea that what you need to do and what this free Credit Card Payment Calculator can tell you. Download FREE Credit Card Payment Calculator Now!